It was quite early in my life when I was confronted with shocking images from war: it was a reproduced picture from Picasso´s Guernica on one of the walls of our school. A picture which stays in my head forever. In one of our religion lessons we were as well talking about Pater Maximilian Kolbe, and learned about martyrism in that context. 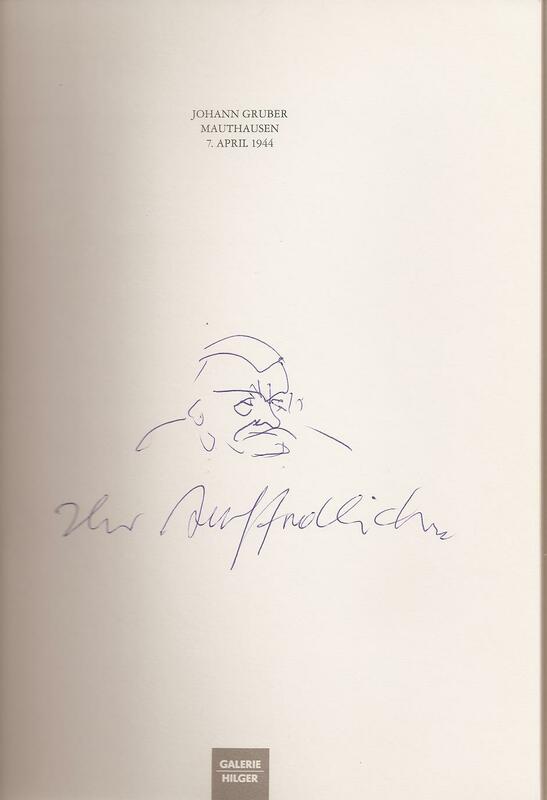 Guernica, Kolbe,… how comes the context now and why to Alfred Hrdlicka? The first time I really got in touch with the artist Alfred Hrdlicka was at the time when the controversial discussions about his “sculpture against war and fascism” on the Albertina square in Vienna took place . 1988 ( i was 18 at that time) the sculpture was finished. As I remember, core of the discussion was the jewish man kneeing and washing the streets, which was reflecting the fact, that after “the Anschluss” (Austria was was affiliated by the german Nazi´s) jewish people had to do degrading work. The helplessness of the jewish man in Hrdlickas sculpture shaked me up as he is for me a ” symbol” for all the inhumanity taking place in today´s world. In 1993 I was participating on one of the exhibition openings at the Gallery Hilger in Vienna, where Alfred Hrdlicka was present. I bought the book “Johann Gruber – Mauthausen” . Why? The book starts with with the description, that in a little chapel in Mauthausen, there is a oil painting next to the altar done by the polish painter Jan Molga making visible 3 persons: Dr. Johann Gruber next to Sr. Edith Stein and Maximilian Kolbe. Why Dr. Johann Gruber ?, what was bringing him to this camp and what was the reason that he got next in line with Kolbe and Stein? The book gives the answer.